Ahhh, giveaways—it’s been awhile, huh? 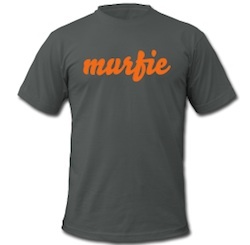 So here’s your chance to enter a Murfie Giveaway today, ‘cos there’s no day like today! The human being who writes the most awesome haiku poem (English style) about music, as judged by the crew at Murfie, wins $50 of store credit AND a custom Murfie T-shirt. Heads-up: 50 bucks will take you very far on Murfie—lotsa and lotsa albums are only $1! As a refresher, an English-style haiku consists of 3 lines of 17 syllables total (5, 7, 5). The subject matter simply has to be MUSIC—whether it be about the first CD you owned, your favorite band, the music you are embarrassed to love, etc. The winning haiku will be published here on our blog. For a chance to win, leave a comment to this post with your haiku poem before midnight CST on Monday, September 3, 2012. Be sure to fill in your name and email address (your email is not published). Please, one haiku per email. The winner will be notified by email during the week of September 3rd, and the winning haiku will be featured on our blog shortly thereafter. I adore mi amor, OOOPS!!!! Love them all – do you? In front of the staff!